Tough start to league season for Cliffe FC, a 3-1 defeat away to Hemingbrough, 4-3 away defeat at Wilberfoss Reserves, and Sunday team come unstuck 11-1 at home to title contenders Malt Shovel. Cliffe FC finally began their 2016/17 Division One campaign, sadly a 3-1 defeat to local rivals Hemingbrough United was the result – ultimately a bad 10 minute period either side of half-time seeing ‘Boro score all three goals. Cliffe matched the home side through out the first half, but a penalty was awarded on the 42nd minute – Luke Zacharenko going over a dangled leg, spot-kick converted for 1-0 at the break. Phil Newstead went close at 0-0 but Cliffe trailed at the break. Cliffe still were feeling the effects of the sucker punch before the break, Craig Allen (one of the many ex-Cliffe players in the home side squad) scored with a speculative effort that found it’s way into the bottom corner, completely wrong footing Ally Harris in the Cliffe goal, 2-0. Two was quickly three, a through-ball breaking the offside trap for Craig Rowden to score, 3-0. Cliffe answered back and Dan Collins scored a header for 3-1, Callum Ransome drew a save from the ‘keeper and Connor Potts saw a shot go wide that might have set up a grandstand finish – 3-1 the full-time score. Nathan Leach earned Cliffe FC man-of-the-match for his battling display in the middle of the park. Whilst a defeat, once again the manner of performance was encouraging and the result should soon follow for the young side laden with potential. Next week is the arduous task in York FA Cup, away to last year’s Premier Division runners-up in the shape of Wigginton Grasshoppers. Elsewhere, Cliffe FC Reserves suffered a narrow defeat to Wilberfoss Reserves in their first league game in Reserve C. A lack of proper goalkeeper cost Cliffe dearly, and goals from Joe White, a Tim Mizen header, and Kieran Dinsdale weren’t enough. 4-3 to the home side the full-time score. MOTM: Joe Corbett. Next week, the Cliffe FC Reserves are also in York FA Cup action – they host Hemingbrough United’s Reserves side – a tasty tie! 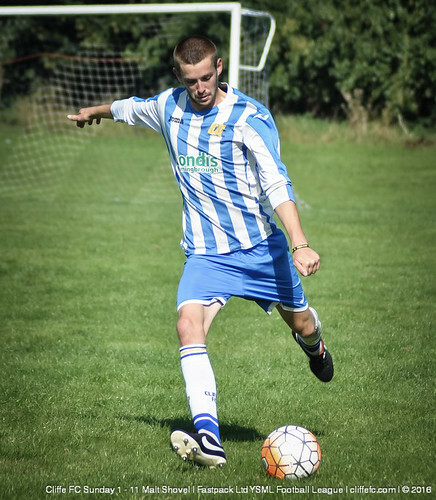 Another thud in the welcome to the big time for Cliffe FC Sunday’s top division adventure, as one of the title favourites in the shape of Malt Shovel hand out an 11-1 defeat. The scoreline was a dominant one, but the first 15 minutes may have developed in a different way, Cliffe actually taking the lead, an Andy Edwards freekick headed in by Tom Collins, to put Cliffe 1-0 ahead. Shovel eventually equalised and then raced into a 5-1 lead at the break as they overwhelmed Cliffe going forward, 1-5 HT. Six second half goals made it 11-1 to the away side, Cliffe only showing short flashes of what they can do but being outdone by the fitter and more organised Shovel side, 1-11 FT.
Next week, Cliffe FC Sunday, also in York FA Cup action, face Beeswing away – a real opportunity to get a a first win of the season.